We Must Be Turning Japanese! The Spanish Government yesterday played down fears of a crash. Rafael Pacheco, the Housing Director, said the figures showed that Spain was experiencing a “gradual and gentle landing for house prices. You cannot speak of a crisis,” he said. “These figures are bad and worse than expected,” the finance minister, Elena Salgado, said. The sharp quarterly increase was a sign of “how severe and how deep the crisis is,” she said. I'm sorry. That joke never gets old to me. Here's an update. I found another gem from the past. That which must not be thought! Spanish officials have furiously denied reports that the country’s property market is heading for a crash or that a clutch of banks may be in the same boat as Northern Rock. That which must be furiously denied! I'd quote the article, but I think the headline says it all. You could lose being the global bearer of irrational exuberance though, for a good ten years and counting. As we'd mentioned in an earlier review, one business sector is booming. Books examining the current economy and the causes of its precarious condition are apparently a growth industry -- at least on the production end. The bulls would tell us that from a contrarian standpoint, we must be close to the bottom. The bottom didn't immediately fall out of the stock market and/or real estate market when the bookshelves were full of books telling us all how to get rich though. The bookshelves are just now filling up with books urging caution. When the majority of books told us to buy stocks and real estate, we bought stocks and real estate. It became a positive feedback loop and was self-reinforcing. Prosperity seemed never ending. So what's going to happen when we are told to do the exact opposite? What's going to happen when the majority of books tell us to save money and pay down debt in order to weather the financial storm? Oh oh. So the premise herein is: forget about a recession; we're either in or heading into a depression; take the requisite steps, include getting out of stocks, selling short, buying gold and investing in currency. How are any of those "requisite steps" going to help our economy's situation? Further, couldn't give gold away at $250 an ounce just a few years ago but everyone wants it at $900 an ounce? I just saw yet another advertisement on TV. They want to buy gold from me. They listed off a LOT of local hotels I could sell it at. I sold 3 silver dollars at a local hotel in 1982. Using hindsight, it was actually a great time to sell, not buy. Heck, even though I am and was a bear, I sold all my gold and silver in 2006. At the time, I thought I got a really good price. I still do. A return in excess of 50% in just two years seemed just that, excessive. I'm really starting to warm up to the idea that overcapacity is trumping money printing and that deflation might be with us a lot longer than I originally thought. I offer a few examples to prove my point. Albertsons is having a great sale this week. Buy 10 boxes of Keebler Chips Deluxe Cookies (12.5-18 oz) for just $1.97 each and get two free movie tickets for free (up to a $24 value). This is how I see it. Go see a movie with your girlfriend and get 10 pounds of cookies for free. Wow. That's not exactly what I would expect to see if inflation was about to skyrocket. I should also point out that neither the cookies nor the movies are even made in China. Last week we managed to buy Tillamook Yogurt at 3 for a dollar. We bought close to 40 of them over the past week. I'm actually back to enjoying the grocery fliers again. I have little brand loyalty and abuse the @#$% out of the government's CPI substitution adjustments, primarily because I do much more than just substitute. I actually back up the truck. Substitution bias occurs because the CPI measures the price changes of a fixed basket of goods and services and thus does not capture the savings that households enjoy when they change their spending in response to relative price changes of goods and services. A lot of people complain about the substitution bias adjustments. I don't. It seems perfectly rational to me. Further, it is my belief that the government actually underestimates the effect of substitution, at least as it relates to me. I don't just substitute if it is a really good deal. I'll actually buy more of it, perhaps a LOT more. Mountains of cookies and yogurt over the past two weeks, with no reduction in my lifestyle whatsoever. Cookies freeze well. Yogurt keeps a month and a good third of it has already been eaten. That's just a sampling though. I obviously don't just eat cookies and yogurt. Chuck roast is $1.59 a pound this week. It freezes too. Don't get me started on peak oil though. I'm not THAT deflationary, nor will I ever be. I'm buying more inflation protected I-Bonds on Monday. I'm still willing to hoard anything that Mad Max would want, but only if the price is right. Near as I can tell, "the worst diamond market in living memory" never entered his thoughts though. Some stores of value might not actually be forever. I've been thinking about how investing in years that end with 9 hasn't worked out so well over the past century. It sure didn't work in 1929. 1999 was bad as well. That was not all it seems. First, a few comments about the following data. It does not include dividends so keep that in mind. During periods of high dividends, that can make up for some of the pain. Further, the data has been cherry picked. I'd much rather start with a theory and then look to the data to find support for the theory. In this case I have started with the data and ended up with a theory. That's not a scientifically strong way to do it. That being said, I think the following data is decent trivia at the very least though. Click on it for a larger image. The first "compounded" field shows what would have happened if you had let the money ride. In other words, you bought stocks in every September of a year that ended with a 9 and sold them in every September of a year that ended with a 2. There are 24 years included and the second "compounded" field shows how you would have done in a typical year. Note that even if you strip out the horrible returns of the Great Depression, you'd still have been doing poorly in future periods (with 1949 to 1952 being the only exception). In sharp contrast, the following shows the historical returns of buying in years that end with 2 and selling in years that end with 9. That's 49 years in total. Note that the typical return in a given year was -8.61% in the first chart and was 6.12% in the second chart. That's quite a difference. Don't just look at that though. Compare and contrast the individual periods. Here's a wacky theory on what might be going on. Ever drive down the road and see that your odometer is about to rollover? What is it about all those 9's turning into 0's that makes it so interesting? In my opinion, it almost feels like "peak mileage". From 1999 to 2000, we had a lot of 9's turning into zeroes. We had a lot of other things turning into zeroes as well. Many dotcom companies are no longer with us. So what does that mean now? Perhaps it is not best to be buying stocks in September of 2009 with the theory that selling in September of 2012 would be a good idea. 1969 was a particularly good year (not to invest). We put a man on the moon that summer. The Concorde was also introduced. We're done going to the moon it seems and the jet that could fly from London to New York in half the time was retired in 2003. Good times. Hey, at least we have a robust and resilient banking system using the very latest in modern financial innovation, or so I was told. That counts for something I guess. Sarcasm is a must these days, lest I go insane. I made every attempt to provide accurate data in my tables but I cannot guarantee accuracy. I do provide the source data though so feel free to recreate it and/or at the very least check my work. It is improbable that the governments of the world can prop up the "unpropable". "Government funds do not address the structural problems the industry is facing, including global overcapacity, the need for industry-wide consolidation, high capital intensity, and automakers' fixed-cost structure," Standard & Poor's said in a report. From consumer products, raw materials, to airports and other infrastructures to name but a few, saving the banks does not address the problem of overcapacity and the simple truth is a lot of the growth that took place in the past years will have to be scaled back. Given Japan's experience, it is possible to see that no government can always spend its way out of economic problems. The best thing a government can do is create a stable economy that encourages people to spend without worrying too much about the future. "We can not easily conclude that the economy has bottomed out. The industrial situation remains serious," he cautioned. Lou said overcapacity, including in the steel and auto sectors, was intensifying because of weak domestic and global demand. He said companies, especially smaller ones, still faced acute funding shortfalls because of rising inventories. Beijing has tried to address their financing difficulties by leaning on banks to give more credit to small- and medium-sized enterprises. Almost all of Europe’s manufacturing industry has felt the impact of the recent financial crisis. Overcapacity is increasingly apparent as demand slows, and executives across the continent are now under pressure to adjust workforces and realign their businesses to recent market developments. I continue to ride this crisis out in TIPS and I-Bonds. In hindsight, I'd have done better without the inflation protection. However, in an environment that destroyed wealth in the trillions, not losing purchasing power was still a relatively good strategy. I'd do it again. In fact, I am doing it again and will continue to do it again. The I-Bond rate resets on May 1st. The bonds currently pay a locked in rate of 0.7% above the CPI, tax deferred for up to 30 years. That's good enough for me in this environment. I have this sinking suspicion we'll be seeing 0.0% above the CPI at some point. What's my reasoning? 1. We've already seen it once (May 2008). 2. The "smart" economists want negative real interest rates. I also want to point out that I-Bonds do not need to be held the full 30 years. In one year they can be sold (with a three month interest penalty). Check this out though. I-Bonds bought today earn 5.64% for the first six months. The following six months will most likely be 0.0% (thanks to deflation). What's a three month penalty on 0.0%? Not much, lol. This would leave you with a 5.64% return on your money for 6 months, and then nothing for 5 months. Overall, that’s a 3.08% annualized return, and you will be exempt from state income taxes on the interest as well. This is very competitive with current bank CD rates. This is not investment advice. I'm simply stating what I am doing. Further, I won't be selling my I-Bonds in a year. I'm holding them the full 30 years. They can't lose money during deflation (as good as cash). During periods of high inflation, they are somewhat protected from both it and the taxes on that inflation. Only serious hyperinflation can absolutely ruin them as an investment, but in that environment we're all... well, you know. I told friends in 2000 that I'd have put all my money in I-Bonds if the government would have let me. They paid 3.4% over inflation. The government limits how much we can buy in any given year though. They recently lowered it from $30k to $5k (although we can actually buy $10k if we purchase $5k through Treasury Direct and $5k in paper form from a local bank). I just can't seem to get past the headline. Who could have possibly guessed that if jobs evaporate (which we knew was happening with 100% certainty) then retail sales might drop too? This goes well beyond unexpected and into the realm of shockingly sarcastic. Sorry for not posting much lately. I'm pretty down. 1. I've got a head cold that's been dragging on for weeks. I saw the doctor yesterday. 2. Our pet bird is having seizures. That's two trips to the vet so far. 3. Comcast claims that someone else set up an account in my girlfriend's name (identity theft). 4. My girlfriend no longer has a job (in Washington State). 5. Unemployment in Washington State jumped from a revised 8.3% in February to 9.2% in March. "I'm very concerned about it. It's shocking," he said. "The state's now higher than the national average. People were saying this will never happen here. The place is now a free for all unemployment wise." 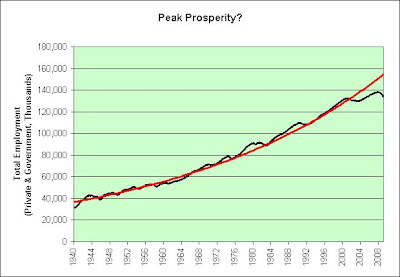 Oh well, at least the Illusion of Prosperity continues to stand the test of time. I'd hate to think that I wasted all this time on bogus theories. Even our modern financial druids are making sacrifices these days. Don't let anyone tell you different. Caesar writes that though the Druids generally used thieves and criminals, as they pleased the gods more, they sometimes used innocent men when no delinquents could be found. "The key drivers of the increase in loss-cost assumptions are the increase in our assumption for peak unemployment and the sharp rise in delinquent loans," S&P said. Wicker loans! Sacrifice the delinquents! Burning Man is an annual event held in the Black Rock Desert, in Northern Nevada. It takes its name from the ritual burning of a large wooden effigy on Saturday evening. Unless the aluminum market turns dramatically or the firm closes more cash-burning facilities, the possibility of further liquidity challenges persists. Burning cash! The gods must be appeased! Why aren't we just attaching the "cash-burning facilities" directly to the cash-printing facilities? That would cut out all the middlemen (workers). Just think of the productivity miracle. The idea, borrowed from the Depression era when the currencies were known as "scrip", is designed to boost local spending and keep money circulating within the community. You know it is bad when we are borrowing from the Depression era. Oh oh. Ben Stein finally likes gold. My itchy stagflationary trigger finger just went limp. This is extremely embarrassing. It's like Groundhog Day. Just when you think he's going to see his shadow and deflationary winter will end soon, the sunny optimism pops out from behind the clouds and you're virtually guaranteed six more years of deflation. Stocks and Housing: Are They Putting in a Bottom? We might also want to diverge from our standard portfolio to put about 10 per cent into gold, the funds taken equally from stocks and bonds. I normally dislike the yellow metal as an investment because of its extreme volatility and long-term poor price performance. But if we have inflation as the result of the immensely aggressive actions of the Fed, gold may be a haven. But bear in mind that, adjusted for inflation, gold is still barely half of what it was in 1979. Forgive me for saying this, but that "long-term poor price performance" concept can be reduced to some degree if you buy things when they are cheaper. Since you offer "expert" financial advice, I'll assume you were buying gold when it was $300 in 2000. To compensate for gold being half of what it was in 1979, adjusted for inflation, here's something that's probably at least twice as big as similar tools from the year 1776, adjusted for "Oh my God! That thing is so frickin' huge!" Now I know these type of vehicles (ie, massive tracked excavation vehicles) exist as semi-mobile mining equipment, but I'm not at all convinced that this is real - it looks way to big, and I don't think these are supposed to cross roads. 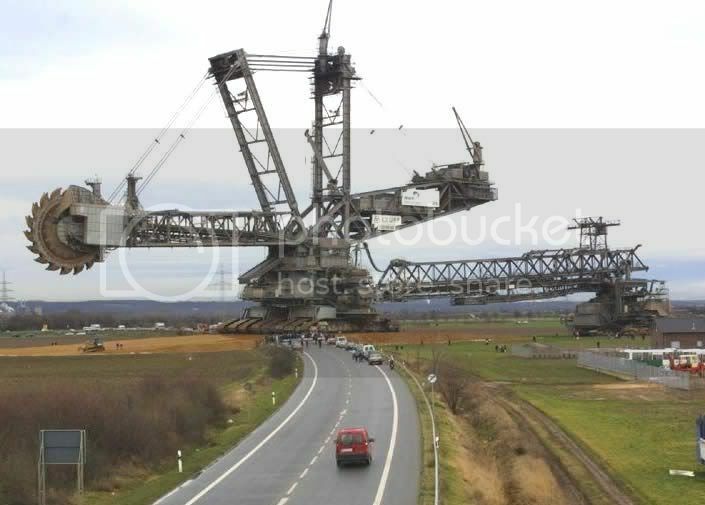 The Bagger 288 (Excavator 288) is a bucket-wheel excavator, the largest in the world. It sure beats the heck out of a pickaxe , although I suppose a billion pickaxes in the hands of a billion Chinese would be an even more impressive sight to see (perhaps even from space). Oh how I dislike heckling stagflation when I have it in my name, but fair is fair. I'm having more and more deflationary moments lately. Let's just say the trips to Costco have been less frequent. It's mostly because I've simply run out of ideas. If the savers are done spending (because they are done stockpiling) and the spenders are done spending (because they are tapped out), then who is left to buy goods at the malls? This assumes the government spends its money on nicer roads to the malls in the name of improved infrastructure of course, and doesn't actually buy stuff within the malls. The Bank of Japan will encourage the uncollateralized overnight call rate to remain at around 0.1 percent. Exports have been decreasing substantially reflecting the deterioration in overseas economic conditions, and domestic demand has become weaker against the background of declining corporate profits and the worsening employment and income situation in the household sector. In addition, there is the risk of a further weakening in domestic private demand if firms' medium- to long-term growth expectations decline and pressures to adjust capital stocks and employment increase. The Bank will continue to exert its utmost efforts as a central bank to facilitate the return of Japan's economy to a sustainable growth path with price stability. Make for Happy Best Time!!! If TV reports effectively zero problems due to Y2K, use extreme caution. The chance of there being no actual Y2K bugs is so small that it's more likely that broadcast stations and local institutions have been taken over by forces of the United Nations New World Order, and that they are broadcasting fake propaganda tapes showing business as usual to control the population. If TV reports no Y2K problems, DO NOT BE FOOLED. Oops. My bad. This was actually supposed to be humor, but hindsight is painting a somewhat different picture. In 1999, those who sold stocks, hoarded gold, oil, and canned goods, entered their bunkers, and simply continued to stay there were called survivalists. 10 years later they are now called expert financial risk managers. Let's start with something I said last month. 2nd Half of 2007? Nope. 2nd Half of 2008? Nope. 2nd Half of 2009? Not likely. Okay, now let's move to today's prediction for the electronics industry. When will the recovery begin? An improving global economic environment should enable the electronics industry to enter into a sustainable recovery in the second half of 2010, allowing a reacceleration in sales in 2011. 2nd Half of 2010? Likely. 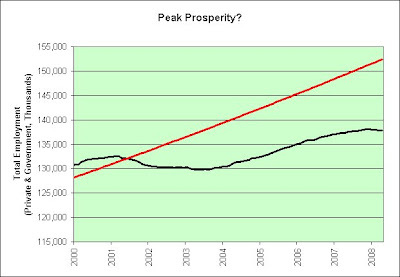 Further, the analysts warned that while it is less likely, overall sustainable growth could be pushed into 2011. 2nd Half of 2011? Less likely. The analysts believe that damage from the current industry recession will not be soon forgotten. With so many blogs tracking potential 2nd half of year recoveries, I doubt the damage will ever be forgotten. Kahle says he launched his project because "we need to preserve our digital heritage. Unless we start saving it, every passing day we're losing the record of one of the great turning points in human history." That was said back in 1998? I nominate that for the Understatement of the Millenium Award. 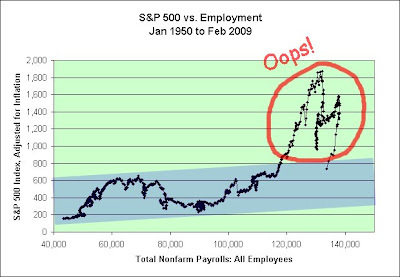 This is a chart of the S&P 500 adjusted for inflation (as of February 2009) vs. the total number of people employed. Why employment? Time can only move forward. Employment can actually move forwards AND backwards though, as we're currently finding out all too well. It can therefore make for a more interesting chart, at least in theory. I have added a blue trend line channel using nothing more than my eyeball. It's nothing more than that so please don't read too much into it. That being said, I'm going to guess that you are dying to read something into it. Therefore, here's a feeble attempt at some witty commentary. The bulls: Yay! See that last black dot on the lower right? That's February of 2009! We managed to dip back into the blue channel! The market is finally a table pounding screaming bargain again! The bears: Boo! We're at the top of the blue channel. What happens if we go all the way to the bottom of the blue channel again? Further, that black line drifting to the left is really freaking us out. It's like the employment clock is running backwards. Scary! The bulls: Yeah, but stocks pay dividends and as seen in the chart, stocks keep up with inflation over the long run. No "risk", no reward. The bears: Yeah, but "safe" TIPS (Treasury Inflation Protected Securities) pay interest and they also keep up with inflation over the long run. No sarcasm this time. As you can imagine, I'm still a bear but I am now somewhat sympathetic to at least some of the bull arguments. I have many layers of bearishness though, much like an onion being peeled back. The new employment numbers were released today. Rather than just put up yet another chart of the downturn, here's one from a slightly different perspective. This chart shows the change in total employment over the previous 10 years. I have included a third order polynomial trend line as an indication of roughly what my eye sees when I look at the chart. Is it any wonder our economy is falling apart? I'm not talking about this latest "cyclical" downturn. I'm talking about the secular downturn that has its roots in the dotcom bubble of the late 1990s. You know, the era when it felt pretty good outsourcing and automating our jobs since we had tech to fall back on. I don't know about you, but I'm really not liking the trend. Perhaps I might be a bit biased though. In addition to running an Illusion of Prosperity blog and being bearish since 2004, my girlfriend was laid off from a "recession-resistant" healthcare provider yesterday. Her missing job isn't included in the chart yet. Perhaps more productivity miracles can save us. Maybe we just need to work smarter. Imagine how prosperous we will be in the future once we have automated and outsourced all of our jobs away. Even once the layoffs taper off, it will be a long, long time before critical sectors like autos and housing begin hiring again. "The current environment is driving companies of all industries to aggressively manage their operations," said Justin Dragoo, VP for consumer products in IBM's Global Technology Services Group. The group saw revenue decline 4% in the most recent fourth quarter, but sales may be poised to rebound if more businesses come to believe that outsourcing can help them better weather the economic downturn. First, let's go back in time and see how the last jobless recovery worked out. Even though real people are losing real jobs that likely wont be replaced anytime soon, the stock market seems to have bought into the conventional wisdom that unemployment is a lagging indicator of economic growth. If you are a stock market bull, you might want to stop reading here. I'll be bringing up painful memories. 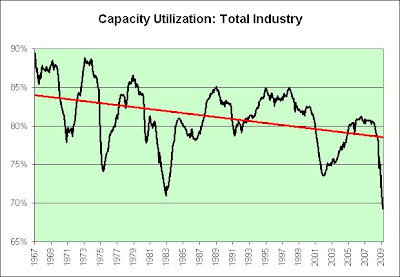 The major problem in this recession (which officially began in March 2001 and officially ended eight months later) and recovery has been an excess of capacity and a lack of demand growth. Weak job growth wont do anything to create extra demand: People without jobs dont buy stuff. And to the degree that consumers with jobs start to worry about the security of their jobs, weak job growth can undermine even existing demand as consumers tighten their belts in anticipation of tougher times. Thats exactly the kind of mind set that produces recessions. Jim Jubak was right. Using hindsight, the jobless recovery didn't work out so well. On September 9, 2003 the DJIA closed at 9,507. Today it closed at 7,978. Even after the impressive stock market rally over the past month, that's still a 16% loss. It's not often you can exit a bull market long before its peak (14,000+ in 2007), ride it out for over 5 years, and be thankful that you did. I think investors will get another chance though. I'm told that we will be getting the mother of all jobless recoveries soon and I am a big believer in the theory. The next question is what kind of recovery can we expect given all the monetary and fiscal stimulus injected into the economy? What comes next, I'm afraid, will be the mother of all jobless recoveries as the economy gradually shifts from contraction to a "growth recession," a phase we'll be stuck in through most of 2010. In my opinion, borrowing money from ourselves to stimulate ourselves is going to do nothing to generate permanent jobs. Here's an analogy. Let's say we are bleeding to death. We go to the hospital. We clearly need more blood but they don't have it. The doctor comes up with a plan. He's going to do a blood transfusion from our left arm into our right arm and he's calling it the mother of all bloodless recoveries. NEW YORK (AP) — Oil prices surged nearly 8 percent Thursday as investors shrugged off a jump in unemployment and focused instead on rising stock markets and the hope that the U.S. economy has finally bottomed out. Forget rising oil prices and rising unemployment. Focus instead on the rising stock markets and hope. Meanwhile, I'll continue to sit over here on the sidelines. In other news, my girlfriend was laid off today from a recession-resistant not-for-profit healthcare provider today. Providence Health Care, which employs some 8,400 people in the Spokane area, said recently it may lay off employees at its Eastern Washington hospitals as the number of unpaid medical bills climbs and budget projections worsen. Hospitals are beginning to see the aftershocks of rising unemployment, which is 9.7 percent in Spokane County. As the number of jobless increases, so does the number of uninsured patients. So, it's not surprising that healthcare is considered one of the most recession resistant industries. According to the Bureau of Labor Statistics, more than half of the 30 fastest growing jobs are in medical fields. Any thoughts on what a depression-resistant job might be? I'd like to be able to offer my girlfriend some of this hope that's become so popular lately. And lastly, I can't seem to resist the joke. They say it is a recession when others lose their jobs but a depression when you lose yours. Here's a look at the long-term employment trend in the United States. It is the combination of total private industry jobs and total government jobs. 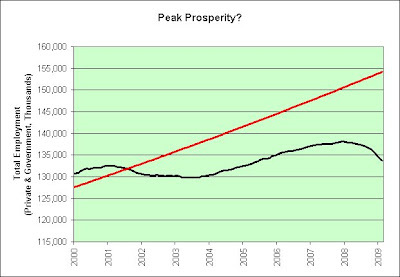 I have included an exponential trend line in red. Here's a closeup look at recent years. We're having a real tough time getting back to the long-term trend line even with massive stimulus. We came up way short with our housing bubble attempt. Investors like to speak of long-term historical stock market returns. 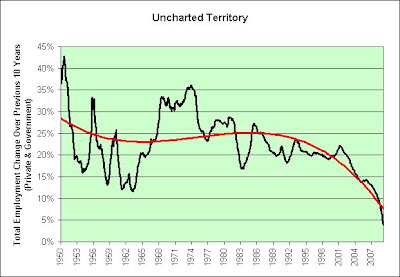 Well, here's a sixty year trend and it is clearly breaking down. I sure hope that stock market investors aren't counting on a grand employment decoupling theory to save the day. Note that employment is rolling over and accelerating. They say that employment is a lagging indicator. At the rate it is going down, there is an increasing risk that it will lag us directly into the next Great Depression. Seriously. When I turned bearish in 2004 people no doubt thought I was insane. Well, we're now roughly 20 million jobs below the long-term exponential trend line. It's not all that crazy of a theory these days. In fact, it is now headline news in the Home & Garden section of the New York Times. AT a time when life in America is beginning to resemble a roller-coaster ride on the way down and everyone is trying to find ways to save money, it may be instructive — both in terms of offering helpful hints and putting things in perspective — to look at how people ran their households during the Great Depression. Some might argue that from a contrarian standpoint, seeing this in the New York Times must mean the worst is finally over. I am not in that camp. I am even more bearish now than I was in 2004. What miracle technology is going to bring 20 million jobs back? I'd really like the optimists to inform me. Be specific. Don't just give me hopes and prayers. Productivity miracles and automation are not known for their ability to create jobs, nor is the outsourcing of jobs to China. Right? Without those jobs, I would argue that every other aspect of our long-term exponential growth model is also suspect. Very suspect. Show me why I am wrong. If I am wrong, I'd really like to know. Further, I really want to be wrong. Please believe me. I should therefore be a relatively easy audience to sway. All I need is one well thought reason why things won't continue to get worse. That's all. The stimulus? Is that it? The stimulus we're borrowing from ourselves and our grandchildren so that we can give it to ourselves? That stimulus? Sigh. You'll need to try harder than that. We were offered plenty of stimulus in 2004. That's what actually turned me bearish in the first place! I can safely say that the more stimulus that is seemingly needed, the more bearish I will become. Then there is the sorry state of Nortel's underfunded pension plan. With the global recession and credit crunch rocking the industry, the prospects for Nortel raising sufficient funds from asset sales to refloat the plan and remaining operations are challenging. "The pensioners are in a perfect storm," Mills said. Ahead lies a perfect storm of an ageing and expanding population with a high burden of chronic disease. Spending on diabetes and dementia alone is expected to rise fourfold in the next 25 years. Costs to the states for health care are projected to double in the same period. New technologies and increased uptake mean that health costs increase more rapidly than economic growth, and we don't actually have any economic growth at the moment. The cuts, Souza said, help create a “perfect storm,” where those who were expected to suppress crime are no longer working when difficult economic times are likely to lead to increased crime numbers. Rob Taylor has been driving a taxi in Carbondale for 10 years, but said the slumping economy and university retention problems would drive him out of business within six weeks. (ChattahBox)—BBC News reported today of a dire warning from England’s chief scientist, Professor John Beddington, predicting a crisis of a worldwide population increase to 8.3 billion, combined with food and energy shortages that will cause a perfect storm of war, unrest and mass migration by the year 2030. The most expensive presidential campaign in history and the cataclysmic financial meltdown of the past few months combined to produce a "perfect storm," Romero told me recently. The storm blew a $19 million hole in the ACLU's budget, resulting in a hiring freeze and the cancellation of various projects, followed by the announcement, in January, that 10 percent of the national staff was being let go. Employees with decades of experience were told to clear out their offices; no department was left unscathed. That brings us to April Fool's Day and the perfect recipe. After the short-term euphoria wears off from the Obama stimulus packages, we’ll be left to discover that we’ve not only squandered even more current and future savings, but that we have cooked up the perfect recipe for stagflation. He repeatedly vowed "you will not see any of your taxes increase one single dime." Now in office, Obama, who stopped smoking but has admitted he slips now and then, signed a law raising the tobacco tax nearly 62 cents on a pack of cigarettes, to $1.01. Other tobacco products saw similarly steep increases. Obama did keep his promise. It was not one single dime, it was much closer to six dimes. Fortunately, I don't smoke. I did point out this though. If you smoke, hoard cigarettes. Hoard toilet paper and facial tissue. Hoard beauty and medical products. Hoard preserves. Hoard canned goods. Hoard medications. If you smoke, hoard even more cigarettes. That's what I see when I look at the list. You will note that cigarettes made the list twice. That's no coincidence. Apparently the cost of their confusion wasn't so enormous after all. That money was better spent on beer and cigarettes, especially if those items were saved/hoarded as part of a diversified nest egg. As seen below, some cigarette hoarders just made an 18% return on investment. They aren't any better off of course, but they did manage to fend off a standard of living reduction for at least a few years. Thanks in part to the largest-ever federal cigarette tax increase -- a nearly 62-cents-a-pack hike that starts Wednesday but was reflected in many prices earlier -- Jukes on Tuesday paid more than $58 for a 10-pack carton at the Cigarette Store in Denver, Colorado. $49 to $58 is an 18% increase. Sin taxes are the easiest to implement since the government can rationalize it as a good thing. Smoking kills. Alcohol kills. Ammunition kills. We've seen the smoking tax. A betting man might favor the odds of future alcohol and ammunition taxes. "It's time we raise the tax and help people live," he said. Increased taxes will help us live better? Fantastic. We'll all be living like kings someday. Good to know! I'm not a big drinker by any stretch of the imagination, but I do have 5 cases of Mike's Hard Lemonade on hand. That should easily last me a few years. I expect it to be a decent/sinful investment. That being said, I could be wrong of course. Prohibition became increasingly unpopular during the Great Depression, especially in large cities. Politicians might soon be handing it out like candy. Who knows!